Doll bathtub and accessories set by Molly Dolly. 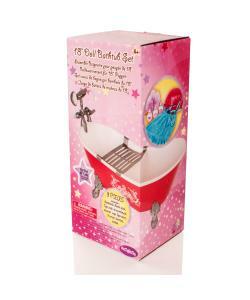 Pamper your 18 inch doll in her pretend bathtub! This deluxe set includes vintage style bathtub, bath rack, tap with shower head, spa Terry dress, silk shower cap, 3 lotion bottles and bath sponge. Each piece is very high quality. You can pretend to give your 18 inch doll a bath with the movable shower head and bottles of pretend soap! When she’s all finished, she can wear the cute blue terry dress! Perfect to fit 18 inch dolls of all styles like Our Generation dolls. Pamper your 18 inch doll in her pretend bathtub! 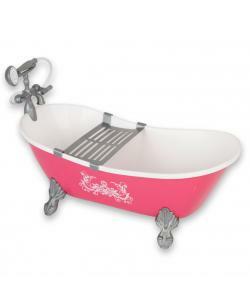 This elegant looking doll bathtub is white on the inside and light pink on the outside. It has four silver legs and a silver faucet. You can pretend to give your 18 inch doll a bath with the movable shower head and bottles of pretend soap! Your doll will love relaxing in this bathtub with the silky pink and blue shower cap and the purple loofah. When she’s all finished, she can wear the cute blue terry dress! Bath time will be so much fun with the pieces in this set!